It’s the spring of 1966 and a young, overeager customer is visiting his local Ford dealership. 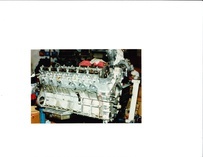 He’s read about the 427 Cobra’s massive big-block power, and he just has to have one. The salesman repeatedly tries to steer the young enthusiast toward the more practical and docile small-block version, the 289 Cobra, but the potential customer will have none of it. He wants the big block. So the salesman dutifully wheels a bright-red Cobra to the front of the lot and takes the youngster for the ride of his life. The legend of the Cobra was founded on apocryphal stories like this one, and has only grown in the four decades since the car first snarled onto the scene. Today the Cobra is perhaps the most recognized shape in automobiledom and certainly the most copied car ever. Although the Shelby American Automobile Club recognizes the production of only 998 legitimate versions, more than 50 companies have copied this amazing machine over the last 40-plus years. We recently spent some time with 10 real ones. A couple of months ago, we got a phone call from longtime friend and 289 Cobra owner Tom Cotter. He had good news: He was putting together his Cobra Moonshine Tour for a few like-minded owners. This would be the second year in a row that Tom and fellow Cobra enthusiast Jim Maxwell would host their tour through the winding mountains of North Carolina. Their reasoning behind the trip is simple: They love to see these cars driven, and the roads in western North Carolina are some of the best in the country -- twisting switch-backs, beautiful vistas and very little traffic. Both of these guys organize this event for the love of the marque. Tom is retired from the public relations business, but that just means he has more time to spend on his automotive interests; in addition to writing books (his “The Cobra in the Barn” is a true gem) and working with Road & Track, he has taken on the co-chairman’s role for the Amelia Island concours. Jim Maxwell is a radiologist from Greensboro who kept telling fellow Cobra owners how great the roads were around western North Carolina. Cotter and Maxwell got together to organize their tour last year for eight Cobra owners in the Deal’s Gap area on the Tennessee/North Carolina border. 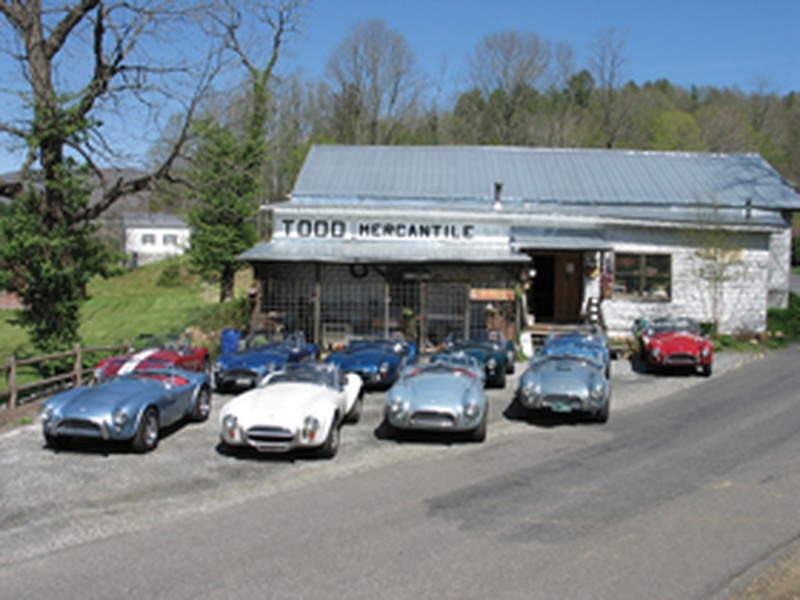 That trip was a success, so they planned this year’s version for Blowing Rock, N.C. A total of 10 Cobras would gather at the beautiful Chetola Resort near this small mountain town, which is about two hours north of Asheville. Next year’s Moonshine tour is planned for southwestern Virginia and a maximum of just 12 cars. Tom is quick to point out that this low number is not out of snobbery, but rather to keep the experience intimate and the whole thing manageable. He and Jim charge each couple $1000 for the trip, with any leftover money sent back to the participants. The approach is casual and they aren’t in this to make money, just to have fun with like-minded owners. Anyway, Tom’s call to us ended with a punch line: One of his friends, Shelby American Automobile Club Registrar Ned Scudder, wanted to bring two of his Cobras. Would we like to tag along and drive one of these cars? Tom didn’t have to ask twice. The three days we spent on this job satisfaction-boosting assignment revealed a number of things to us. Not only were we given the keys to heaven as we participated in the dream of a lifetime, we also got a chance to become more intimate with one of the world’s most iconic sports cars. We also learned a bit more about the people who own and love them. Who Is a Cobra Owner? Frankly, we didn’t know what to expect of our fellow tour participants. Since we didn’t know whether we’d find blue-collar Ford people who had somehow made it big, or savvy collectors who saw the value in jumping on the Cobra bandwagon, we kept our minds open when we joined this adventure. What we found was a group of guys and gals who had indeed found success in one way or another in life, but who were car freaks above all. While they knew every serial number and detail on all their Cobras, they were also quick to talk about the Datsun 240Zs or Shelby Mustangs that they had owned, or in one case the BMW 2002tii that they were currently restoring. Many of these owners had bought their cars early on, and for all of them the Cobra had been at the top of their dream car lists since they were children. Interestingly, despite the astronomically rising values of these cars, none of the people on our trip were fussy about how and where they parked their cars, or who drove them. For three days we heard nothing but, “Here, try my car.” At the end of the excursion, nearly everyone had driven more than one Cobra. Our base at the Chetola Resort put us just two short miles from the Blue Ridge Parkway. While much of the tour was centered around this fantastic, mostly smooth and gently curving piece of engineering excellence, Tom and Jim were quick to pull us off this route in search of twistier bits with less police presence. We spent time on Routes 221, 181 and 194, and went through towns like Banner Elk, Newland and even a detour up to Roan Mountain, Tenn.
We stopped at age-old places like The Todd General Store and had lunch beside the fish pond at the Mast Farm Inn. The unseasonably warm, dry weather we enjoyed on our springtime outing just added to the whole experience. As Tom and Jim were quick to point out, there really are no bad roads for driving in western North Carolina and Tennessee. The roads are scenic and curvy, and there is very little traffic in the area. Like most car enthusiasts, we have a deep appreciation of the Cobra that borders on worship. As Anglophiles by nature and racers at heart, we find that its ultimate marriage of the best of England and the U.S.A., combined with the best racing story ever told, make for a dream car worthy of the fantasies. For three short days, we got to have our dream come true. Now if only we could lie and say the cars were horrible, perhaps we could help drive the prices down so that mere mortals like us could afford them. In the meantime, we’ll have to content ourselves with borrowed glimpses into the Cobra legend. I love story about Cobra, i was born in 1943, so in the sixtys it was my dream car. As an army guy, an Anglia was all i could afford. It was my firts car and i was lucky to enjoy it a lot. But still the Ford AC Cobra is the ultimate car for me. Right now, i am driving a 2007 MX-5 Miata, i like it a lot and i think it will be the closest i will get to driving a Roadster of the sixtys ! Thanks you for the nice article.